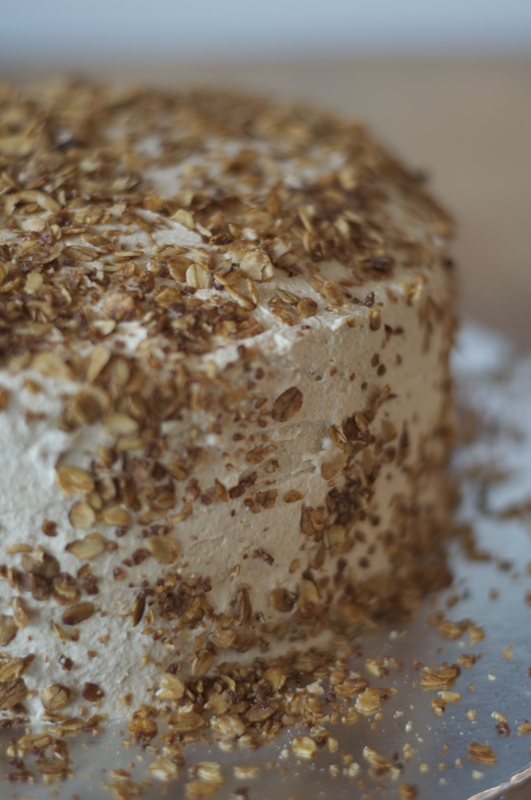 This is one of my favourite cakes to make for a grown-up birthday or celebration. 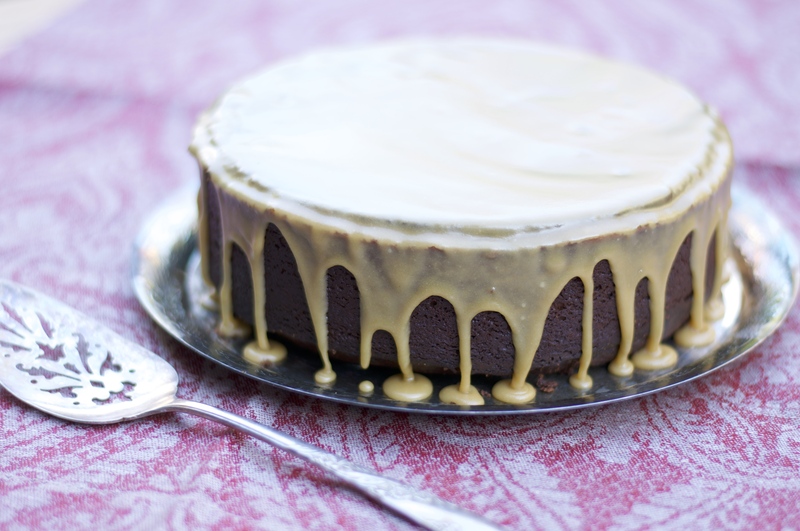 It is delicious and sophisticated without all the fuss of icing a cake. What’s even more helpful about it is that, with the benefit of a dense crumb, it cuts well making it easy to serve. I don’t have a bundt pan, so I use a deep round pan which poses some challenges: I have to cook the cake at 300F for a much longer time period which seems different each time I make it. 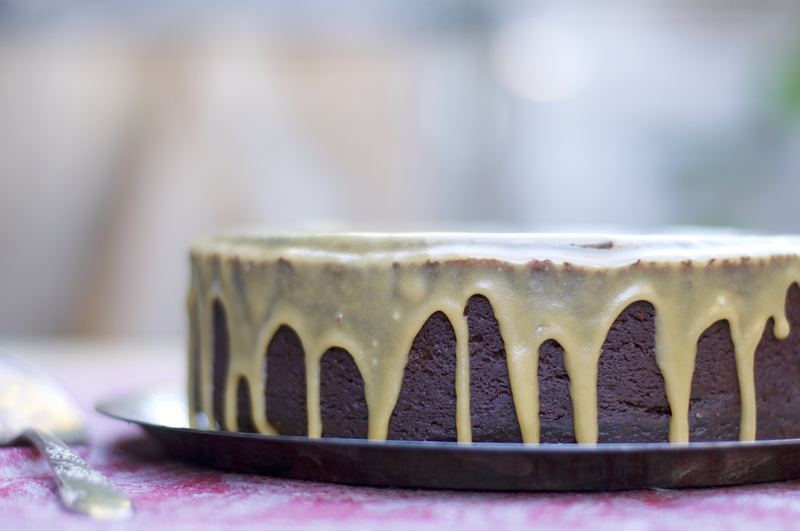 I also never have the luxury of letting the cake rest for a day before glazing it as suggested in the recipe. What I find works just as well is to make the cake the day before it is needed and glaze it that same day, then allowing it to rest overnight in a cool spot. Consequently, it is ready for me to take into the office the next morning and the chocolate flavour has had the time it needs to develop. I’ve seen similar recipes from a variety of sources but this is taken from The Hungry Housewife. Butter a bundt pan (I use a deep cake pan but it takes about twice as long to cook at I do so at 300 F). Sprinkle some cocoa powder in the pan, hold it over a sink, and turn and tilt the pan to distribute the flour evenly. Then invert the pan and tap out the excess cocoa. In a medium saucepan over medium heat, bring the Guinness and butter to a light boil, add the cocoa powder and whisk until smooth. Remove from heat and set aside. In a large bowl, whisk flour, sugar, baking soda and salt. In another bowl beat together the eggs, sour cream and vanilla. Add the butter/Guinness mixture to the sour cream mixture and beat until just incorporated. Add the flour mixture and beat until just combined. Then using a rubber spatula, lightly fold the batter to make sure there are no pockets of flour. Pour into bundt pan. Bake for 55-60 minutes or until a toothpick comes out with only a few crumbs. Allow to cool in pan for 10 minutes. In a medium saucepan, bring the butter, dark brown sugar, heavy cream and salt to a rolling boil. Boil for one minute, stirring constantly. Remove from heat, stir in vanilla extract. Add about ½ cup of the powdered sugar and whisk until smooth. Continue to whisk in powdered sugar by the tablespoon until you reach your desired consistency. 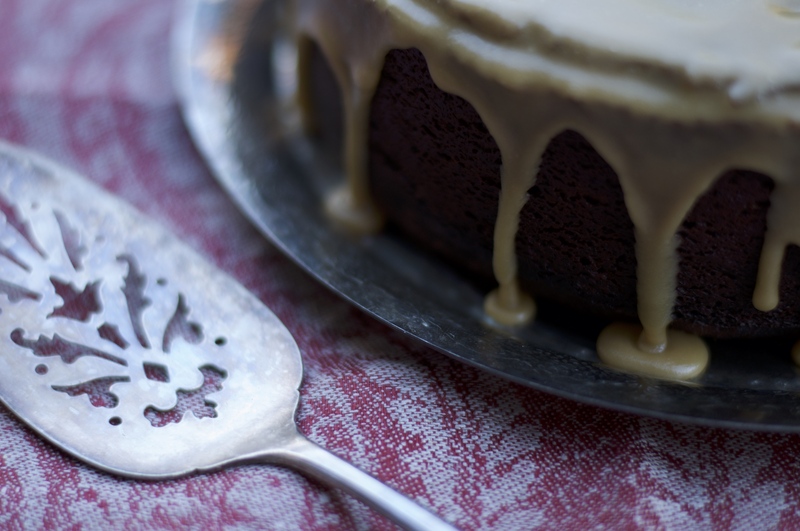 Place on a cake plate and pour the salted caramel glaze over the top. If desired, sprinkle Fleur de Sel over the glaze. You may have noticed that I am a big fan of scones. A dear friend and I came across this recipe on the blog The Pioneer Woman and have been wanting to make it ever since, but time has not been on our side. After telling my mother about the recipe, she made it on a recent morning to share with my classmates. It was a huge hit and I became more determined to make it myself and share it here. It is easy to put together. 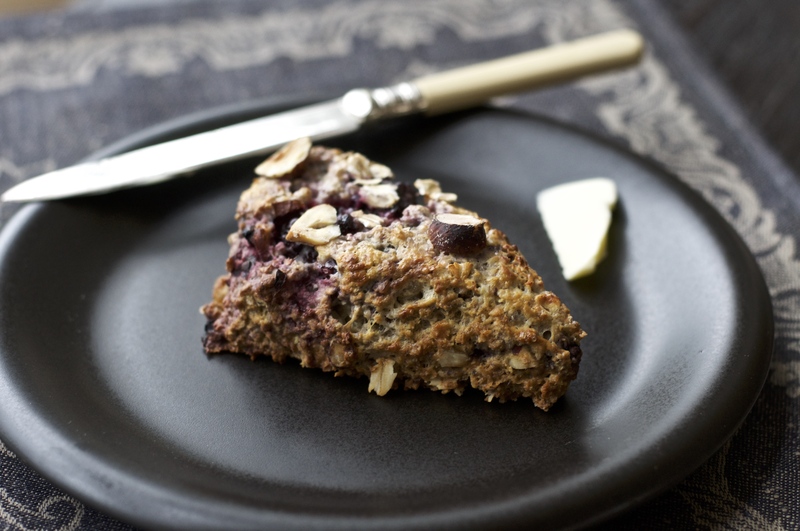 The glaze really takes these scones above and beyond your everyday scone. For a larger group, you can make 2 small rounds, still cutting each into 8 equal portions or simply double the recipe. I wasn’t able to find white whole wheat flour anywhere, so I just used an organic whole wheat flour. I also used salted butter because that was what I had. The result was still delicious. Preheat oven to 425°F (400°F if using a convection oven). Line a baking sheet with parchment paper and set aside. In a medium bowl, stir together flours, baking powder, baking soda, salt, brown sugar, cinnamon, and orange zest, breaking up any clumps of zest. Mix together the buttermilk, orange juice, vanilla, and egg in a 2 cup measure or a small bowl. Set aside. Cut the chilled butter into 1/4 to 1/2 inch cubes. With a rigid pastry blender or two knives, cut in the chilled butter until the mixture resembles coarse meal with some pea-sized pieces. Add the cranberries and mix in, breaking up any clumps of the cranberries. Make a well in the center, and then add the liquid ingredients. Stir just until combined, taking care to not over mix. Try to work quickly so that the butter in the dough stays as cold as possible. If the dough gets too warm, the scones will lose their shape more easily in the oven and have a more relaxed appearance with less defined edges. Transfer the dough to a lightly floured work surface. Working quickly, gently fold the dough on itself pressing it together to incorporate any dry bits that are not holding together. Do not over work the dough. Just make sure it is holding together nicely. Shape the dough into a 7-inch diameter circle and cut into 8 wedges. Transfer the wedges to the prepared baking sheet. Bake until the scones are puffed and golden brown, about 10- 14 minutes. 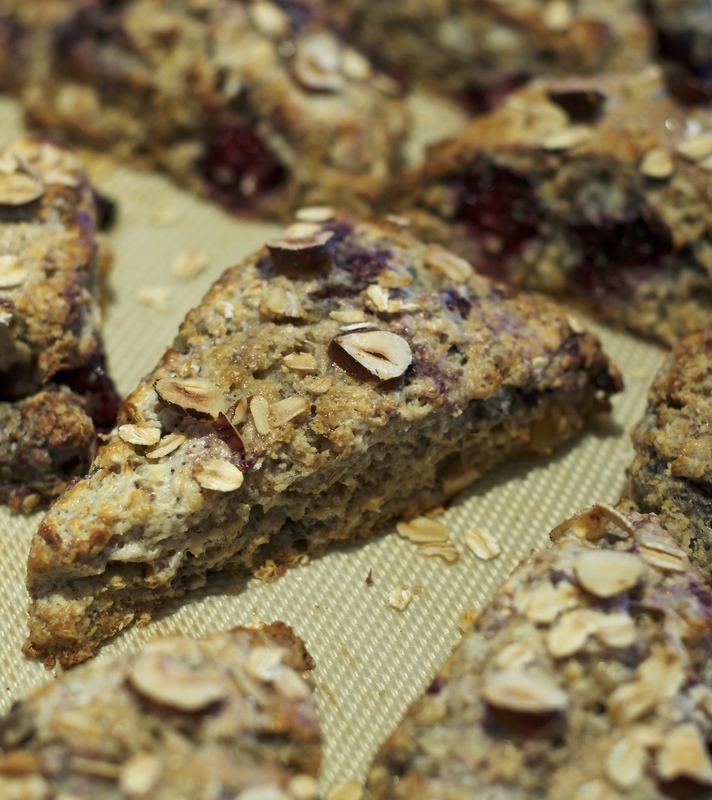 Remove the sheet from the oven and let the scones sit on it for a minute before removing to a wire rack to cool. While the scones are still slightly warm, prepare the glaze. Combine the juice, zest,vanilla and nutmeg in a small bowl. Begin to whisk in the sugar 1/4 cup at a time to achieve a smooth consistency that you will be able to drizzle over the scones, but which is not too runny. Although the original recipe specified 2 cups of sugar, I stopped at 1 1/4 cups of sugar and it worked perfectly. If your glaze is suddenly too stiff, whisk in another teaspoon of freshly squeezed orange juice. Drizzle as much of the glaze as you desire over the scones. Allow the glaze to set completely, then serve and enjoy! I made this decadent dessert for a recent Christmas party. It’s a very grown up desert with the wonderful advantage that it can be made well ahead of time. The recipe is from the Silver Palate Good Times Cookbook. Although it calls for a Sara Lee Pound cake, which can be found in the freezer section of almost and U.S. grocery store, any fine crumbed pound cake will do the job. I used the pound cake recipe in Rose Levy Beranbaum’s The Cake Bible and made my own. I baked the pound cake several days before assembly and prepared the custard the day before assembly. The trifle was assembled the day before the party and refrigerated. Cut the cake into 1/4 inch slices and spread flat on a surface to dry for several hours. Spread a thin layer of the jam on half of the slices. Top with the remaining cake slices. Cut the cake sandwiches into 1 inch cubes and scatter in a large glass bowl. Add the amaretti crumbs and toss together. Sprinkle with the Marsala and toss to coat. Whisk the granulated sugar, cornstarch, and egg yolks together in a medium saucepan. Whisk in the milk in a thin, steady stream. Cook, stirring constantly, over medium heat until thickened to the consistency of a custard. Remove from heat and whisk in the vanilla. Cover with plastic wrap directly touching the custard, so as to avoid the custard developing a skin. Let cool completely. Refrigerate until assembly. Pour the cooled custard over the cake mixture. Whip the cream in a chilled bowl until soft peaks form. Beat in the icing sugar and almond extract continuing to beat until stiff. Spoon or pipe the cream mixture over the trifle. Arrange the fresh berries to your liking, and scatter the almonds over the top. Refrigerate, covered with plastic wrap, until ready to serve, up to 3 days. I first experienced rugelach when a child living in Princeton NJ. My parents used to buy them at the local grocery store, Davidson’s (which sadly closed in 1997). My mother doesn’t eat walnuts which are frequently in rugelach fillings, but Davidson’s had a version with hazelnuts and raspberry jam that she loved. I thought it would be a good idea to replicate them. For the pastry, I went to the excellent blog Smitten Kitchen, which offers a pragmatic approach to rugelach pastry and favours a simple log sliced into bite size morsels and other log variations. However, I still prefer the traditional crescent rolls to the sliced logs. The filling is my own concoction. If hazelnuts and raspberry aren’t your ideal of a rugelach filling, the world is your oyster. There are many sweet filling choices and I’ve seen some interesting suggestions for savoury rugelach fillings. One of the great things about rugelach is that they can be made in stages. The pastry can be made several days ahead of assembly and the rolled cookie can be chilled for a day or frozen (before applying the egg finish) for up to a week before baking. They are best eaten in the first few days after baking, so freezing some of the unbaked ones is a good idea if you want them at their best. It is easiest to freeze the log version, but the crescents can also be frozen. Place flour and salt in a food processor bowl fitted with standard blade. Pulse to combine. Add cream cheese, chopped into large chunks, and run machine until it’s fully dispersed into the flour. Add butter in large chunks and run machine just until dough starts to clump. Dump out onto a clean counter or cutting board and form into four flattish discs. Wrap each disc with plastic wrap. Mix the brown sugar, cinnamon and hazelnuts together. On a well-floured counter or board , roll each ball of dough into a 9-inch circle. If the dough has been in the fridge for a while, it might be quite firm but will soften quickly. The dough is sticky so you will need lots of flour on the rolling pin. I flipped my dough regularly to ensure that it was not sticking. Leaving a 1/2 inch circle in the centre of the pastry clear, spread the circle with a thin layer of raspberry jam. Leaving this small circle at the centre clear of filling will make it easier to get the pastry to stick to itself when rolled. Sprinkle 1/4 of the filling mixture evenly across the jammy surface. Lightly press the filling into the dough. Using a pizza cutter or knife, cut the circle into 12 equal wedges by cutting the whole circle in quarters, then each quarter into thirds. Starting with the wide edge, roll up each wedge gently pressing the point into the rolled dough so that it won’t peel back when baking. (For the log version, see the Smitten Kitchen link above.) Place the cookies, points tucked under, on a baking sheet lined with parchment paper or a silpat. Chill for 30 minutes. Brush each cookie with the egg mixture. Sprinkle the cookies lightly with the turbinado sugar. Bake for 15 to 20 minutes, until lightly browned. Allow to cool on a wire rack. I love the holiday season! This is a Christmas tradition in our family. It comes via my Aunt Robin who got it from her sister. It is an indulgence – there is absolutely nothing healthy about it but it is so delicious and incredibly difficult to resist. I only make it once a year, so that’s ok isn’t it? It is best if you have two people to make it as the caramel begins to set almost immediately when removed from the heat, thus requiring fast action to get the popcorn coated. However, if you can’t find a helper it can be accomplished without assistance. Rubber gloves are a good idea when working with the hot caramel and I wouldn’t make this without the benefit of a candy thermometer. After years of making one batch with margarine and another with butter, the tasters always slightly favour the margarine batch. As a rule, I avoid margarine, but I make an exception for this recipe. Either is delicious and,if I’d never had the margarine version, I’d be perfectly content with the butter version. The recipe also calls for a mix of almonds and pecans. I prefer all pecans, so I go with that. It could also be made without nuts. 1 piece of parchment paper, crumpled into a loose ball. Spread the popcorn across one or two large roasting pans or cookie sheets with sides keeping the corn close enough together to minimize gaps. If you have a pan large enough to accommodate the popped corn in a single layer, it is easier to work with than two pans. Sprinkle the nuts across the top. Place two wooden spoons or silicone spatulas and the crumpled piece of parchment beside the pan(s). Melt the margarine or butter in a 1 1/2 quart saucepan. Add the syrup, vanilla and sugar stirring constantly and bringing to a boil. Continue boiling, stirring regularly for 10 to 15 minutes until the mixture reaches 285-290 degrees F on a candy thermometer, putting on the rubber gloves when the temperature reaches about 245 degrees F. Remove from the heat. Quickly drizzle the caramel in a stream across the corn mixture. Toss the corn with the spatulas or wooden spoons to coat the corn mixture as thoroughly as possible. Use the parchment ball to flatten out the mixture. Allow to cool. When cool, break into pieces storing in an air tight container. 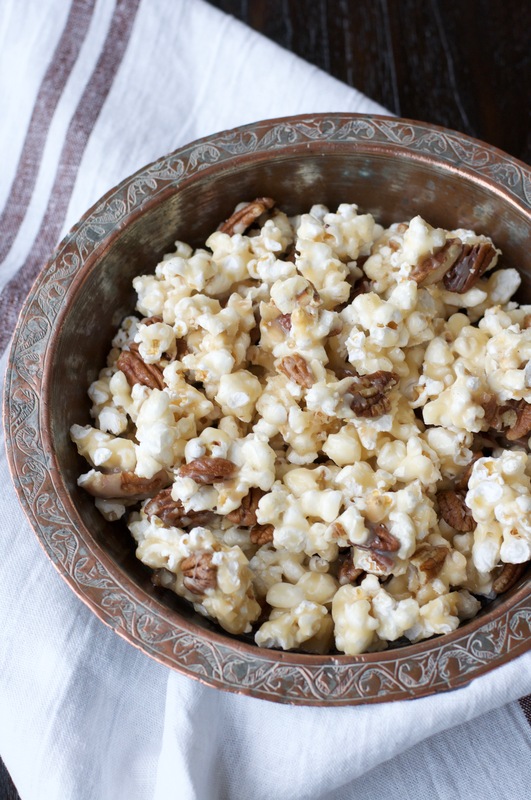 When I have help, I make a double batch using a larger saucepan to make the caramel and a very large stainless steel bowl filled with the popped corn and nuts to mix in the hot caramel. As I drizzle the hot caramel over the corn mixture, my assistant (wearing the rubber gloves) vigorously tosses the corn mixture and hot caramel, being careful to avoid any contact with the stream of hot caramel. The still hot coated mixture is then turned into two roasting pans, tossed a little more, and flattened with crumpled parchment before being allowed to cool. As the season for baking ramps up, I’ve been thinking a lot about these cookies. They are quite different from most of the cookies I’ve tried. If you’ve looked through my blog, you will have seen that I have a penchant for foods that can boast of lemon. In this recipe the lemon is rounded out by the addition of orange. The cornmeal gives a lovely crunch and texture to an otherwise very simple and rustic cookie. The Italian name for these cookies is Crumiri, however, we shape them by hand in the form of Torchettini, the way my mother was taught some years ago. If you decide to make these, plan to set aside a morning or afternoon to do so. The dough comes together in no time at all, but the rolling and shaping takes a good deal of time. 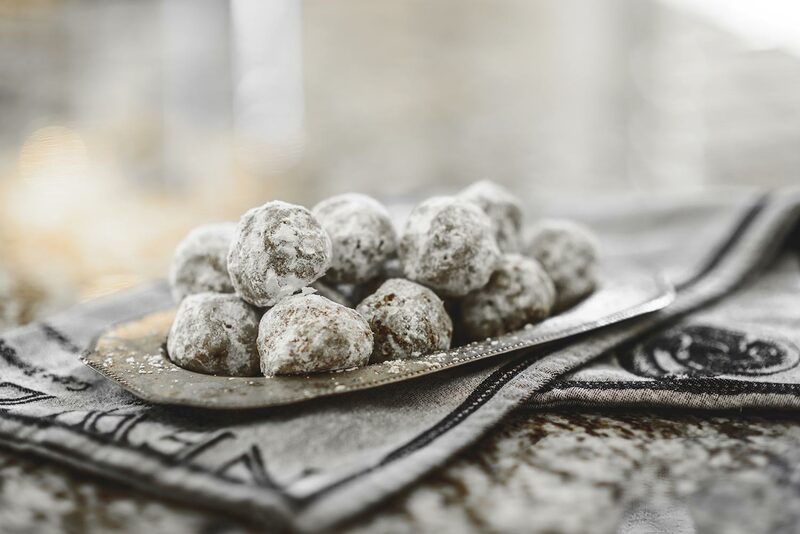 The dough is challenging but forgiving to work with, and in the end, with a little patience, you will have a lovely cookie that is fantastic with tea or coffee. Preheat the oven to 350 degrees Fahrenheit (325 if using dark coloured baking sheets). Line the baking sheets with parchment. Using a mixer, cream the butter and sugar. Beat in the eggs. Add the vanilla and zests mixing to incorporate. Add the salt, cornmeal and flour. Mix to create a dough that pulls away from the side of the mixing bowl. Remove the bowl from the mixer and take a lump of the dough (enough to make a 2 inch round lump) and knead it together in your hands to meld the dough into a more solid mass. Using your hands like a rolling pin, roll the dough on a wooden cutting board to create a long thin tube of dough. Cut off a six inch piece of the tube and gently fold into a U shape using your fingers to support the curve of the U as you bend the dough. (The dough has a tendency to crack and will crack during baking as well. Don’t fret – these are rustic cookies.) Allow one end of the U to be a little longer than the other. Fold the longer end over the shorter end. The two ends should end up approximately even looking in length. Bake for 17-22 minutes watching carefully and removing at the first sign of browning. If they cook too long they will be tasty but hard. Last time I gave you a super simple recipe. Today I am posting my longest recipe yet! When I think of birthdays, this cake immediately springs to mind. It is a birthday tradition in my father’s family. It is made every birthday, whether the celebrant is present or not. Even though it might seem like a cake for grown-ups, I loved it as a kid and my 7 year old son loves it too! Making this cake is a project: It’s not difficult to make, but it does take planning and time. Refrigerated, it lasts well, so even if it isn’t possible to eat it all in one sitting, you can be sure of having a delicious treat for several days. A word of warning, sometimes the pitted cherries aren’t all pitted, so you may get a pit in your bite of cake. In our family we consider getting a pit a prize and an indication of good luck to come. Liqueur of your choice such as Kahlua, brandy, a cherry liqueur or a reduction of the juice from the drained cherries. Heat oven to 350 F. Prepare three round cake pans. I use non-stick pans and line the bottoms with parchment rounds. Cream shortening and sugar. Add eggs and vanilla. Sift the dry ingredients together in a separate bowl and then add to the shortening mixture alternating with the buttermilk. Pour the batter into the three cake pans pushing the batter from the centre slightly up the sides of the pans. Bake for 35-40 minutes. Allow to cool for 5 minutes before turning out of the pans. Remove the parchment. Allow to cool completely. Combine the sugar, coffee and salt. Mix with the cream. Chill for 3/4 hour in freezer, stirring occasionally. Remove from freezer and beat until soft peaks form. Add the vanilla and beat until stiff. This is going to be the “icing” so it does need to be stiff. Combine ingredients in saucepan. Roast on a low-medium heat on the cooktop until brown stirring continuously. Be careful not to burn. Allow to cool before assembly. Slice the cake into 6 layers – you will only need 5. If the cakes are too domed, keep the dome on one of the halves, but even out the others. The filling will deal with any moderate unevenness so a perfectly flat layer is not required. The domed layer will be the top (5th layer) of the cake. Reserve the domed layer until the last. Begin with a flat layer taken from the bottom of one of the cakes. Sprinkle a little of the liquor of choice or reduced cherry juice across the cake. Spread a layer of the cream mixture across the cake. Sprinkle with about 1/3 of the drained cherries. (The cherries are added only to the lower layers of the cake to make it easier to cut). Add another cake layer, press it down into place firmly but gently and repeat. Then add a third layer and repeat. Add the fourth layer repeating except with no cherries. Add the top domed layer and ice the outside of the whole cake. Sprinkle the cake with the oatmeal crumbs. 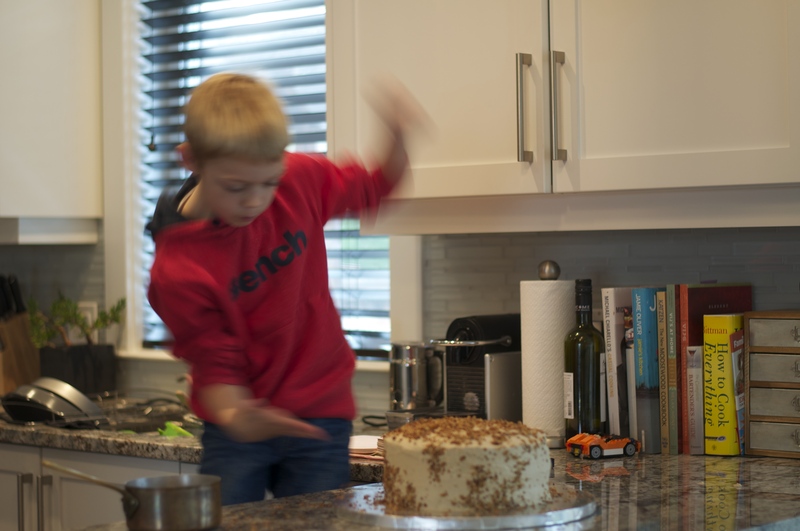 To get them to adhere to the sides of the cake requires “throwing” them against the cake. This recipe is a personal favorite of mine. As a child, my Omi would always sneak me a “bedtime snack” after dinner, dessert, and even brushing my teeth. To this day, I find these little cookies irresistible. In order to create an ‘About Me‘ for this blog, I invited my good friend and photographer Joshua Lawrence over to get some shots of me in the kitchen (and of course to munch on cookies). Beat butter, sugar, and vanilla together until fluffy. Dissolve coffee in hot water and stir into butter mixture. Sift dry ingredients into mixture. Add chopped pecans and stir to blend well. 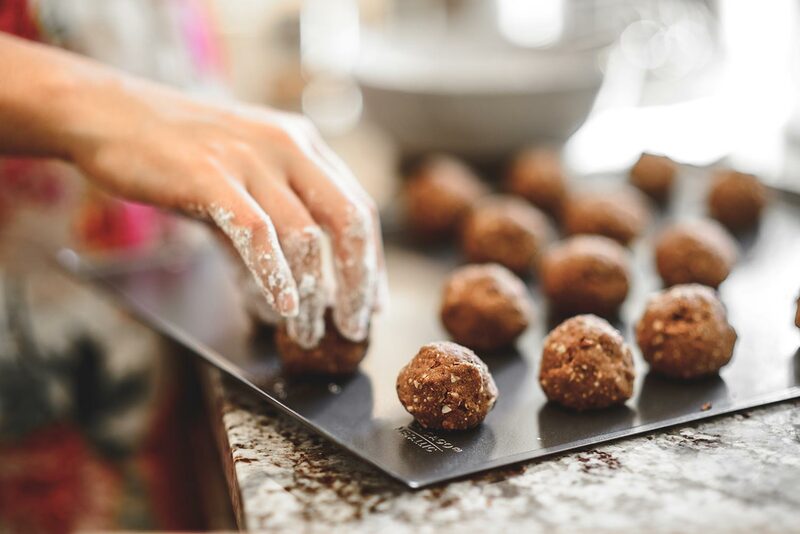 Shape into 1″ balls and place on ungreased cookie sheet. Bake at 325F for 15 minutes or until set. 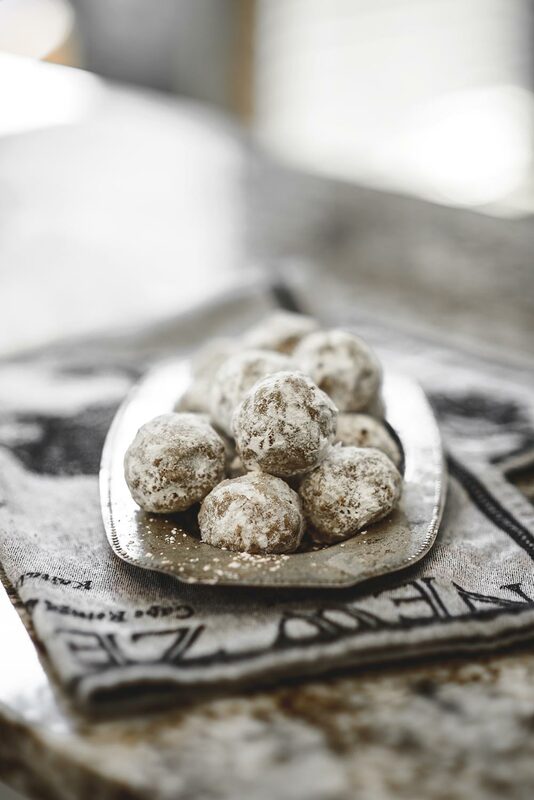 Roll balls in icing sugar while still slightly warm.